The original static installation had started to collapse and had had to be braced structurally to hold it in place; the double glazing had also failed. The client not only needed this fixed, but wanted to have it open over the pool as well. A planning condition was that our work should visually match a number of existing static roofs in the immediate vicinity. We also had to overcome a number of restrictions imposed by the building freeholder, all this on the 11th floor of a Thameside building. After preliminary research we determined that all parties’ concerns could be solved with an array of imaginative and innovative design and installation features. As a penthouse pool room it has unrivalled views across London and now also has unmatched access to the elements. Depending on the preference of the pool users, the roof can be open or shut during inclement weather. When shut, it is impossible to tell from the street that it can open, as the design encompasses a flush fitted inter-roof junction which follows the ridge line to keep its presence unseen. Other tailoring included fitting the entire roof externally with false painted glazing bars. Internally the finish is dull polish stainless steel. The building owner did not want any structural or waterproofing modifications to the surrounding roof, so meia designed a fully cantilevered track and support system for the 1800kg roof system, fixed only to the upstand around the existing hole. A master key switch can force the roof closed whilst cleaning and maintenance is undertaken, to eliminate risk to personnel. Likewise an anemometer is fitted to auto-close the roof if wind speeds are high. A design option possible with this style of roof could have been to use only 6 huge panes of glass. In this instance 44 panes aree required by planning restrictions. 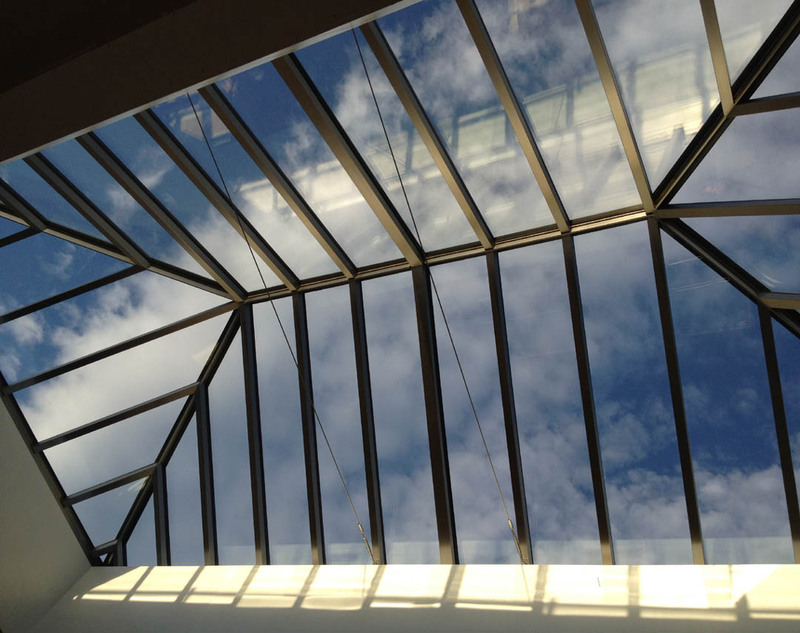 As is standard with meia installations, the roof is fitted with rain detectors to close in the event of rain. However this function can be over-ridden to allow swimming in the rain. The closing cycle takes only 35 seconds, so sudden inclement weather is quickly kept outside. A separate, battery powered standby drive system enables closing in the event of a power or systems failure. Our experience and use of high quality components allow our products to operate in challenging, humid environments such as a pool rooms.